Innovation and strategy expert Ron Adner of the Tuck School of Business says that innovation doesn’t happen in a vacuum – instead, a web of participants often work together to find new solutions. But when they do, who’s in charge? As our world becomes ever more connected, fewer innovations and initiatives stand alone. New markets require collaboration among multiple participants to take shape, and businesses need to form networks of cooperation with investors, suppliers, complementors, and even customers. Innovating in such “ecosystems” creates a new set of challenges for organizations and their leaders. Ron Adner, the David T. McLaughlin professor of strategy at the Tuck School of Business and the author of The Wide Lens: What Successful Innovators See That Others Miss (Portfolio, 2013), has been studying ecosystem strategy for more than two decades. In that time, digital tools have connected everyone in the business and innovation fields more closely. But even as networks have become increasingly complex, the right business response can be elusive. Organizations, Adner says, struggle to capitalize on new technologies and effectively manage relationships with their allies, competitors, and peers. Adner wrote in The Wide Lens that “in some ways, ecosystem challenges can be viewed simply as traditional project management challenges writ large.” The critical difference, he argues, is in the way the boundaries of both the players and their roles are drawn and defined. Often there is no agreement on who is the project manager, and key participants may not even be aware that they are part of the project. In an interview with MIT Sloan Management Review, Adner says that while many efforts at collaboration become stymied by leadership issues, it’s possible to effectively manage those challenges and and usher in novel ideas. Let’s start with the basics. 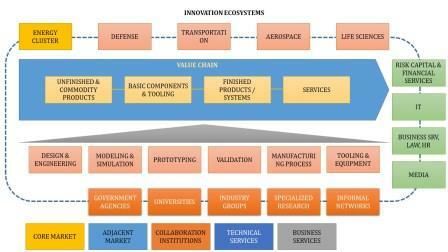 How do you define the concept of innovation ecosystems? There are two approaches to this concept. The first, which is the more common take, sees ecosystems as a set of interactions among a diversity of actors that leads to good things. This is what people have in mind when they talk about the Silicon Valley ecosystem, or the healthcare ecosystem, or the Apple ecosystem — where lots of things are happening around the gravitational pull of one actor. There’s all this energy and flow and money and ideas, and they interact productively with one another. My view is somewhat different. I see the innovation ecosystems as a multilateral set of partners that need to be aligned for a focal value proposition to materialize. These partners collaborate because they want to compete with whatever the established proposition is. They want to replace the incumbent technology. Thus, my approach starts with the desired value proposition and then considers who needs to be aligned; as opposed to starting with a set of ingredients and then being unclear about what the end product is going to be. The reason I’ve found this definition useful – both in my academic work and my work with companies – is that from that starting point, it is easier to build an ecosystem strategy. So what does the right strategy look like? An effective ecosystem strategy requires not just a sense for how a group of companies is going to work together, but why they would choose to work with each other in a particular way. Managers need to first understand what it is that they’re trying to align, and then to craft a strategy to bring about the alignment of those parties efficiently. Think about this: If six firms are trying to collaborate, they can’t all be in charge. So one big question is, who’s going to lead this alignment, and who is going to agree to not-lead this alignment? This is a whole new level of conversation, and it involves asking how we think about leadership and followership in the context of ecosystems. Usually, firms that are winners in their industries are trying to collaborate with other firms that are winners in their own industries. These are companies that define themselves as industry leaders, and that makes them such appealing partners because they have the right capabilities and resources. But ask them which of the group is willing not to lead, and they don’t always have an answer. What you end up seeing — and the world is rife with these examples — is well-intentioned efforts at collaboration that get paralyzed at the post-pilot stage. And yet, in almost every single case, there’s a way of seeing these challenges in advance, adapting strategies to them, and safeguarding success. Communication is very important, then. Communication is critical. Because while it’s very easy to get people to agree on an overall value proposition, what I find, in both cross-company ventures and intra-company collaborations, is that even when there’s full alignment on what the value proposition is, there are diverse views about what the value blueprint should look like. It’s getting coherence at that structural level that is the key to moving things along efficiently. What can managers do to capitalize on these insights? The very first step is to step back and ask, regarding the project they’re in charge of, “To what extent does this depend on collaborating in a new way with other partners?” If the answer is, “Not very much” – for instance, if you are launching a third generation version of a medical device – then even though all kinds of collaboration are involved, no new mode of collaboration is required. The priority will be whether the device delivers and how much better it is than the previous generation. But no one else in the ecosystem will need to move around to accommodate it. That’s one world, and in that world what really matters are traditional notions of execution excellence. But you could imagine a different kind of innovation, for, say, a different medical device. That device might require a new set of collaborations with the sales team or across different departments within a hospital – maybe you need imaging and testing before you can put the device to work. In a situation like this, just having a great device is not enough to ensure its success. And this is where issues around identifying and managing co-innovators comes in, the other people who must innovate for your innovation to matter. You must identify the new actors in your adoption chain, the other people who need to buy in before your end consumer can benefit. That’s where ecosystem strategy becomes critical. For a manager’s perspective, the first thing to know is whether they’re in an ecosystem world or not. If they’re not, they still have the hard work of execution. But if they are, then great execution is necessary, but it’s not sufficient. The counterintuitive thing is that a manager’s natural inclination may then end up looking like an over-investment in execution. Some of the resources and effort focused on improving execution would have been better allocated to managing the ecosystem. In an article earlier this year, you talked about the way the film and camera company Kodak stumbled in trying to remake itself for today’s digital world. You wrote: “Since its bankruptcy in 2012, Kodak has been a poster child for innovation incompetence.” What made the digital shift for Kodak so challenging? The big difference with digital is that there are more things moving on their own trajectories at a faster pace than ever before. When Toyota, for instance, introduced the Prius plug-in hybrid in 2012, they were able to combine an internal combustion engine and an electric motor, and that was huge because in the physical world, that kind of combination is difficult and rare. But in the digital world, those kinds of combinations are really quite easy. Moreover, while the pace at which physical devices like electric motors have improved has been meaningful, it’s nothing compared with the pace at which digital storage or wireless connectivity have improved, both in terms of bandwidth and pervasiveness. That’s what’s making this environment so complex in terms of strategy. Still, even though it’s harder than before, if you know what to look at, it’s not impossible. The organizations that are able to do this, and do it before the rest catch up, will make outsize gains, precisely because of that complexity. All this is accelerated by the Internet of Things. How do you think IoT will affect innovation ecosystems? The reason everyone is excited about the Internet of Things is precisely because of its potential for revolution. But its actual impact may take much longer to realize than current expectations suggest precisely because of this challenge of alignment – key questions about who’s going to own the data, and who’s going to be responsible if something happens to that data or if an instruction set is miscommunicated. An equally big question will be, who gets the credit for a win? Think of collaborations in smart city lighting, between an electric company and an IT company. Even if you can get the products right, it won’t be automatically clear which party is in charge overall, and which is responsible for other issues like approaching the cities and ensuring performance. All these things need to be negotiated within the coalition before they’re finalized on a commercial scale with the consuming world. In the early goings of most collaborations, the focus is on demonstrating feasibility and running pilots — which means that often all these questions are underappreciated until quite late in the game. If the strategy is crafted with them in mind from the outset, the reward can be substantially better, and more efficient, outcomes.